and a guy looking over his reading glasses is pretty hot. Does it help if you have greaseball hair like Schmucky? HB to Clarice’s mom! Wow. Ovechkin knocks out a fellow Russkie an Carolina up 1-0 while those guys get 5 minutes. Finally found the Caps on CNBC. But iffy on streaming. Have to up with Jim Cramer. That leaves out Chuckles and his spectacles of doom. Keeps cutting off. Going to bed early and watch on tablet. So the wrong Notre Dame burned? Ryan will be with Buttguy in SB. We don’t need more idiots in IN. Limited tickets available for tomorrow's Blue Jacket vs. Lightning game. A few crappy seats left at ~ $125. Most seats are north of $300. Better on TV. See more. You thought the pulitzers were irrelevant before? More rumors about the fire being intentionally set. As I mentioned earlier, my friends were there this morning, and there was a long line to get in. It’s not possible that it was empty. I’m sure it’s teeming with tourists all day long, even if they’re just waiting in line. The interior stone arch ceiling appears to be intact. Reportedly all the religious valuables are safe. The interior is largely intact. The sculptures on the spire were removed four days ago. An aerial water dump would likely have done more harm than good. Water on hot stone wouldn’t have done good things to the stone, and the sheer force of the impact might have knocked down the interior stone ceilings. Happy birthday to your mother, Clarice! Thanks for the tip Jimmy k.
Photo allegedly an hour or so prior to the fire. It was definitely open. Video statement by Macron with English subtitles. Pretty low-class of Ovi to take that fight with Svechnikov. 19-yo rookie and Ovechkin has 50 pounds on him. Happy Birthday to Clarice's mom! So Macron will rebuild with other people's money? 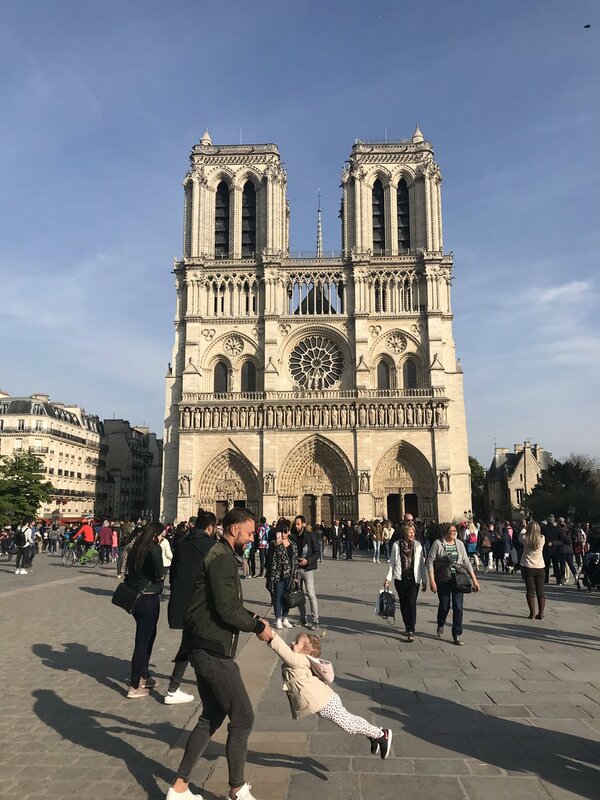 Oh, that pic from Notre-Dame I just linked? As if I keep track of everything! If it's a repeat, on an event like this, it is more than welcome. Selma Hayek's husband reportedly pledged $100 m to the rebuilding effort. No MM Igor it from you, I’m a follower of yours. I didn’t note the “Retweeted by” part at first. Indonesia's elections are on Wednesday. Stu has done a short tutorial on what's going on. We need some happy news. Video at the link. Gosh, it is so, so horrible about Notre Dame. I just can't believe it. My whole family is in shock--my youngest, who was just there in March, told me he wept when he was in it from its splendor and the weight of history--and now he is weeping for it now. All so sad. That's tremendous about your mom, Clarice--100 is a great feat! Congrats to her! KH at the BJG blog notes an interaction. Im jealous, wish that I had a Trump Shop nearby! Was traveling on rt41 today around punta gorda fl, in a 12-14mi stretch there were 2 curbside pop-up type tent “Trump Shop”‘s. Passed the first, stopped at the second one cause there were a dozen or so cars and people around it and it was on my side this time. Anyway ended up chatting with an AA retired former union (electrician) life-log dem (did vote Reagan second time around) who #walked away “for good” basically in 2016, along with his wife. He actually lives in MI (snowbird), he ain’t going back to dems – “everyone has gone completely nuts, it’s like they all live on some other planet, any sense of reason or what is good for the country is completely gone”. African illegals at the southern border. — Border Patrol says they are on the lookout for Ebola. Sadly, "Ebola has a 14-21 day incubation period where the infected show NO signs." The current Ebola outbreak in the DRC is the second deadliest in history, with 772 dead out of 1,220 confirmed cases since the outbreak was declared on Aug. 1, according to the World Health Organization (WHO).